A 1.6-liter V6 turbo revving at 15,000 rpm with unlimited boost that turns small drops of fuel into 600 horsepower aided by an electrical system that pumps out another 160 electron-charged horses. This is the pinnacle of engine development. 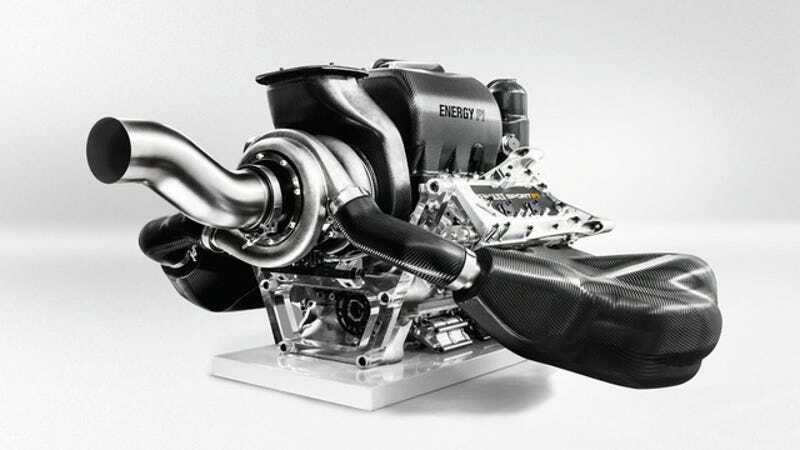 As we get to know more about this season's brand new F1 engines, current champion Renault has released all the info they can share about their state of the art vacuum cleaner V6. This turbo is nothing like the old one. For this season, our friend Bernie and the FIA have introduced a double restriction. While the fuel quantity for the race is limited to 100 kg (220 pounds, -35% from 2013), the fuel flow rate (which used to be unlimited with the V8s) can be no higher than 100 kg/h. That makes the "unlimited" turbo boost pressure top out at around 3.5 bar. Designing the tiny V6 was hard because its architecture is very different to the incumbent V8s. The pressures within the combustion chamber are almost twice as much as the V8's at up to 200 bar — or 200 times the average atmospheric pressure. If the engineers can't prevent the turbo from producing a 'knocking' within the combustion chamber, the engine will blow up, which is something they can't afford as only five are permitted per driver per year. Engine development is also frozen during the season, but "changes for fair and equitable reasons" will be permitted. Direct injection is there to help save that much needed fuel, and Renault is even considering cylinder deactivation through corners. Somehow, I doubt that would work well with the turbo, which will be rotating at 100,000 rpm, sending lots of heat energy to be converted to electric power that will be stored and can later be re-deployed to prevent the turbo slowing too much under braking. The challenge is to reduce lag to near zero to match the instant torque delivery of the V8. The system does the job of a normal wastegate, but just in case there's a conventional one on Renault's engine too. It has to be both bulletproof and small enough to fit the tight package. If the enormous pressures manage to break it, the engine is pretty much a goner for the race. The intercooler will have to take more in 2014 as well. KERS is replaced by two motor generator units – the MGU-H, recovering energy from the exhaust and the MGU-K recovering energy from braking. The MGU-K will generate three times as much heat as the V8 KERS unit did, and if it melts, the car will rely on internal combustion only, making it effectively uncompetitive. The MGU-H absorbs power from the turbine shaft to convert heat energy from the exhaust gases, but is also used to control the speed of the turbocharger to match the air requirement of the engine by slowing it down in place of a wastegate or accelerating it to compensate for turbo lag. While the electrical system is only twice as powerful as last year, the energy contributing to the car's performance is ten times greater. The battery has a minimum weight of 20kg (44 pounds), and the system will produce large electromagnetic forces which can impact the accuracy of sensors. The whole design is utterly complicated. Under acceleration the internal combustion engine will be using its reserve of fuel. The turbocharger will be rotating at maximum speed (100,000rpm). The MGU-H will act as a generator and recover energy from the heat and energy lost in the exhaust and pass to the MGU-K (or the battery in case it needs recharging). The MGU-K, which is connected to the crankshaft of the ICE, will act as a motor and deliver additional power to pull harder or save fuel, should the control electronics be so configured. At the end of the straight, the driver lifts off for braking for a corner. At this point the MGU-K converts to a generator and recovers energy dissipated in the braking event, which will be stored in the battery. Under braking the MGU-H converts to a motor to keep the rotational speed of the turbocharger high enough to avoid the curse of the turbo engine – turbo lag. This is a phenomenon experienced under braking when the turbocharger speed slows as a lower volume of gas is produced. When the driver accelerates and more gas is produced, the turbo can take time to return to full rotational speed. To prevent this lag, the MGU-H turns to a motor and powers the turbo, keeping the rotational speed as close to optimum. When the driver exits the corner and gets back on the throttle, the MGU-H returns to a generator and picks up the energy from the active turbocharger and exhaust gases. The energy recovered can either power the MGU-K to keep the fuel burn as low as possible or charge the battery. They call the borderline between what is physically possible and the impossible 'minimum lap-time frontier.' Since the 'full boost' can be only sustained for one to two laps, what the teams need is to operate on that frontier and be as close to the impossible as they can. A complex problem indeed which needs advanced 'power scheduling.' We'll see how it all comes together, but at least one thing is for sure: During qualifying, drivers can go 'flat out, as always'. If the rest looks slow, call Bernie.